If you are using Teamup calendars in your organization, you can get them displayed in Meeting Room Schedule display app. This can be done by integrating the team calendar with Google Calendar by subscribing to iCalendar feeds. Please follow the below steps to integrate a Teamup calendar to Meeting Room Schedule free. 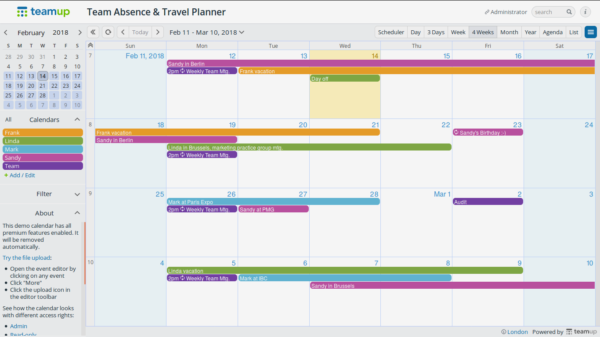 The iCalendar link gives a read only version of the Teamup calendar (read more). Read this article to know how to get the iCal link from teamup. Now the added calendar will be in the “Other Calendars” section. Changes made in Teamup Calendar won’t be instantly updated to third-party applications such as Google Calendar when using the iCal feed. Google Calendar updates their external feeds approximately once per day.